Gerard Pique admits Barcelona will need a "magical" Champions League night at the Nou Camp to overturn a 2-0 first leg deficit against AC Milan. 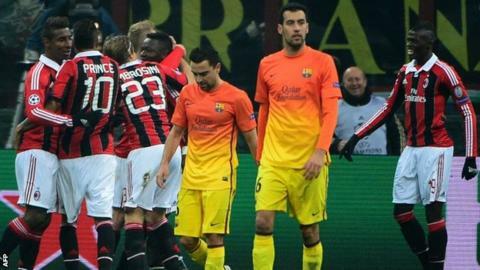 Goals from Kevin-Prince Boateng and Sulley Muntari at the San Siro put Milan in control of the last 16 tie. "It's a really bad result. We played badly and can't make any excuses. We must learn," said defender Pique. "We will look to respond on one of those magical nights at the Nou Camp. We will try to win the return game." AC Milan have won the European Cup or Champions League seven times - in 1963, 1969, 1989, 1990, 1994, 2003 and 2007. Only Real Madrid, with nine triumphs, have won it more times than Milan. Striker Filippo Inzaghi scored twice the last time they won a final, beating Liverpool 2-1 in Athens. Barcelona have won the competition four times - in 1992, 2006, 2009 and 2011. Their last triumph was also against English opposition, with a 3-1 victory over Manchester United at Wembley. The Spaniards were far from their usual fluent and creative selves as Milan, seven-time winners of the competition, provided a tactical masterclass in the art of containing talents such as Lionel Messi and Andres Iniesta. Barcelona, 12 points clear at the top of La Liga, were favourites to progress to the quarter-finals at the expense of a Milan side who are third in Serie A, 11 points behind leaders Juventus. But victory puts the Rossoneri in a strong position ahead of the return leg on 12 March and gives the Italians a chance of avenging last season's Champions League quarter-final defeat by Barcelona. "When they scored the first we lost control," added Pique. "This is a difficult place to play and Milan are a club with a big history." Spain international Iniesta promised it would be a "different story" when the two sides meet in the Catalan capital. "We were lacking a freshness in terms of ideas," said the Barcelona playmaker. "There is a return game to play and we have to believe we can come back from this. "From the very first minute at the Camp Nou we'll be going for it." Milan's Muntari said: "We played as a team. Our coach did a fantastic job. "We were very disciplined and closed every angle. Barca are the top club in the world, they play fantastic football and have amazing players. They're going to make you suffer if you don't have discipline. "2-0 is a lot but the Nou Camp is not easy, they can win by five goals. They have amazing players but we'll do our best," he said of the return leg.